Breathtaking visuals and an enchanting flute playing the morning raga Ahir Bhairav ( Carnatic – Chakravakam; Bhajan – Gauri Taye ) set the mood for devotion and peace. There can’t be a better way to charge up as we begin the week! Many people start their day with a prayer that says – “God, please give me peace of mind” If you are one among them, this MMS is specially meant for you. When Pujya Gurudeva declares – “There is no greater penance (tapas) than peace (shanti)”, we realize – Peace is a form of ‘Penance’ – an austerity that we have to practice. This is a huge paradigm shift when seen from a layman’s perspective. When we say “God, please give me peace of mind”.. sounds as if God has to carry and door deliver a few kilograms of peace at our doorstep. You cannot buy some ‘good health’ off the shelf at Walmart or Big Bazaar. They don’t stock it there. ‘Good health’ is a state of being. You get there by exercise, by taking nourishing food, by rigorous physical and mental discipline. So it is with ‘peace’. It is a state of being.. you get there by practice. Peace is something you make happen within yourself. Peace is an ‘inside-out’ radiation.. not an ‘outside-in’ acquisition. Practicing peace is difficult, because the mind is not used to staying in one place – in the present. It is always preoccupied with fears (bhaya)of day to day existence (bhava).. of birth, of death, of past, of future, and of what can happen in between. Such a mind can never sit in penance in the first place.. practicing ‘peace’fulness is a far cry. So, how to practice being in ’peace’? The mahima of our Sathguru is that He does not stop with saying ‘what to do’. He also elucidates and even demonstrates the ‘how to do’. How to get into the penance of peace ? Gurudeva often says “Like how bhojan nourishes the body, bhajan nourishes the mind”. All of us have watched our Gurudeva doing bhajan. Just try and recall how His Holiness loses himself in that experience. Now, go back to the video up there and play that again. As you watch His Holiness in spotless white vastra symbolizing peace, as you watch the bright morning sky and the beautiful flowers, as you hear the melodious tune of ‘Gauri taye’ … sing along with it… just lose yourself in that ecstasy. These are moments of peace.. of bliss .. that you must experience. There is no greater penance. Just do it. Jaya Guru Datta, Swamiji! As I looked at this message this morning, I was thinking about how people become addicted to negative emotions. Seeing the wavy lines emanating around your head reminded me that we often keep ourselves agitated in our own minds with our own thoughts that disturb our peace. Learning to become aware of our personal emotional addictions is hard. But overcoming those negative life patterns and internal thoughts and replacing them with peace is possible with the tools that you have given us. Seeing you dressed in white this morning reminded me that regular practice of Datta Kriya Yoga is one way to bring peace into our minds and to become aware of those patterns.This is a powerful message…. Datta Peetham is an island of peace in the cacophony of worldly existence. Datta Peetham is the aura of Pujya Sri Swamiji who is verily the embodiment of peace. So, wherever Sadgurudeva travels, a world of peace travels around his divine embodiment. So, being present in the peaceful presence of Sadgurudeva, the mind stills, the worldly activity of the Indriyas concedes defeat and goes to a hiding. Penance is the natural outcome of Sadguru Nama Smarana and Sadguru Darshana. Koti koti pranams to the Lotus feet of Parama Pujya Santha Swaroopa Sadgurudeva !! Pranams and thank you Pujya Puttuji for the peaceful and pleasant Monday start !! Thank you for the beautiful SGS MMS with Gouri taye !! transformed. As we follow Pujya Appaji’s various methods we feel happy and contented, monkey mind controlled and begin to enjoy peace !! Patience is the greatest penance No greater penance than peace !! Saccidananda is the truest end !! Saccidananda, Lord of true bliss eternal !! Sri Saccidananda jananyai Namah !! Saccidananda tattvayoga Santirastu !! JGD.Sadguru tells us,penenace gives Greater peace, the accompanying ‘Gowri Taye,sankara’ jaye keertana tells us the Prayer aimed at Mata will be wise.Who is Ever and more peacefull than Mother?,Except Sadguru? Peace is so important. When I have peace I don’t create problems, because I feel, what is the right way for my life. When I go the right way, I don’t create problems. Then a also do what I have to dowhat is important to work on my karma, I make penance. I wish i remember this saying always and especially during trying times, so as to maintain my calm and peace. Sri Ganapathy Sachchidananda Sadgurubhyo Namah, Om Namo Hanumathe Namah, Sri Guru Datta . Jai Guru Datta! So patience and peace are closely related as they are both a great penance. Certainly patience leads to peace. Such a powerful vertue it is, such a “simple thing” as patience. May Guruji-Appaji bless all of us with tons of patience! Sri Swamiji’s bhajan on flute is so calming and peaceful. Beautiful message to start our day. This message reminded me of a wonderful and amazing bhajan of Sri Swamiji on ‘World Peace’. It shows us the way of how to be peaceful. If only this bhajan can be made as a mandatory prayer in every school. Let there be peace, contentment and prosperity! Let there be peace in all the worlds at all times! Let there be devotion, comfort, and wealth! Let the desires of the devotees be completely fulfilled! Let there be riches, spiritual knowledge, and a peaceful nature! Let the children and grandchildren progress! Let the material assets multiply! Let animosities subside! Let there be friendliness! Let all beings be looked upon as equal! Let there be surrender at the Guru’s feet! Let that be a qualification! Let there always be company of saints and noble souls! Let there be overflowing kindness! Let there be gentleness! Let all hearts glow with the fullness of Love! Let the focus be on the stillness between thoughts! Let there be detachment! Let there be the attainment of pure Existence, supreme Consciousness, and eternal Bliss! This bhajan can be found in album ‘Gnana Sindhu’ and ‘Inner Healing’. Humble prostrations to the lotus feet of Sri Swamiji who is shaanti personified. To keep up peace is often only about letting go my own ideas. Swamiji is a master in teaching me that. Thank You so much for Your great support. We will remember this blessing and will try to implement being in peace as penance. Jaya Guru Datta Swamiji. Whenever HH Swamiji enters the room we can feel the peace. Thank you Swamiji for giving us the peace. I completely agree with what Prasadi is talking about. Om Namo Hanumathae Namaha. Sree Guru Datta. Peace is a “state of mind”. It is intrinsic to every individual. It solely depends on the individual to find that peace within himself. Now how can he achieve this? By overcoming inner enemies (earlier MMS), by making friends with forgiveness (again mentioned in earlier MMS), by cultivating noble thoughts (yet another earlier MMS). etc. Peace cannot co-exist with hatred and revenge (also an earlier MMS). So, one has to constantly keep away from internal and external demons and should be forgiving to everyone. Peaceful mind can achieve unfathomable success. Appaji has shown us by example as to how we can be at peace, nama sankeerthana, chating mantras, controlling our mind, unselfish prayers are all some of His examples. These are not easy to do. Yet, we need to strive hard to become peaceful within, indeed a great penance!! I really love the way each new MMS is linked to an older MMS. Either as stand alone MMS or as a link, these MMS’ are working wonders. These constant reminders are helping me a lot. Am sure a lot of people are also being helped. Thanks Appaji for leading us by example. JGD!! For me it is very hard not to react when attacked. I find that the more I react the greater the conflict and the greater the turmoil of my mind. During a horrible experience a few months ago I had lost my peace of mind due to me being unable to ignore the insults that were happening. Eventually I gave up and laid the problems at Sadgurudeva’s feet. He came to me in a dream and asked for water. I offered the water and this insurmountable problem resolved itself. My peace was restored. The water prasad actually tasted like amrita, after being offered to Sadguru! 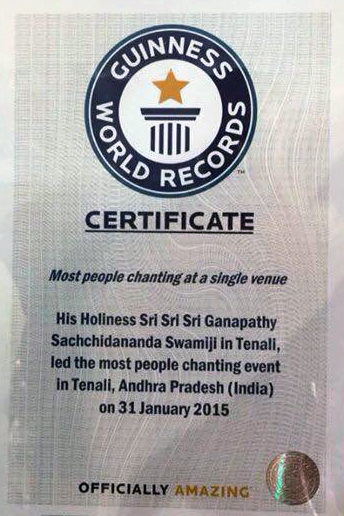 Such is the power of our Sri Sri Sri Ganapati Sachidananda. Blessed are we to know him. Om namo Hanumate namaha. Jai Guru Datta, very calm and peaceful video. Perfect for starting a new week. Pranam Swami Ji for showering these blessings on us and moving us towards the righteous path. We are very fortunate that we are part of Datta Family. We are extremely blessed that we are born during your Avtara. You have given some of us long rope to move in out but have pulled us towards you when the time was right again. beloved Sadgurudeva ,help me to be peaceful and patiently all the time! I thank You for Your precious help and support! S.G.D.! Yes, of course all of us try for happy life with peace of mind. Attaining peace of mind is possible only with good or positive thoughts. I feel today’s message is continuation of yesterday’s MMS, to teach us the path to be followed for peace of mind. “Gowri Tate Shankara jaye” one of the compositions by Sri Swamiji on Mother Goddess, thank You Puttuji for sharing this wonderful video. Jaya Guru Datta, thank you for sharing this beautiful prayer of Saint Francis with us! I noticed that peace goes when i have negative thinking, so i pray to my beloved Sadguru for help to have clear mind and find peace with in myself and consequently with the surronding. Om namo Hanumate namaha. For me peace has so many facets. It is the inner peace of mind as the peace with friends, family, colleagues at work and all animals and humans around us. i learn through Sri Swamiji’s teachings that i have to clearify also long standing conflicts in my family. And i am sure that with His help we will find new ways and solutions. Jaya Guru Datta Puttuji !!!! OM THATHSAT OM THATHSAT OM THATHSAT OM OM SHANTI OM SHANTI OM SHANTI OM !!!!! Sree Guru Datta !!!!! Jaya Guru Datta! Delightful comment! Jaya Guru Datta! Thank You for today’s lesson, Puttuji! Truly, Swamiji’s bhajans, discourses, daily emails and now this MMS has resulted in peace of mind that I have not experienced before. It’s not as if I was unhappy all the time, it’s just that I’m beginning to discover how to be peaceful. I was always a happy person, but I’m only now understanding that true happiness and true peace are different from what I experienced before. What I experienced before was worldly happiness rooted in my ignorance. After an occasionally good yoga session or prayer session, I sometimes feel very peaceful. I know I haven’t even skimmed the surface of true peace of mind, but the little glimpses I get in to it are solely by the grace of Pujya Swamiji. Swamiji is teaching us to be peaceful and calm regardless of the situation surrounding us. This is hard, because we are conditioned to react to and be influenced by whatever surrounds us. But, Sri Swamiji’s messages about anger being a foe, about patience, about purity of mind are all driving us towards true peace and happiness. By teaching us that peace is the greatest penance, Sri Swamiji is showing us an easy way to get closer to Him. By, keeping the mind free of distractions and staying peaceful, we are doing penance. And doing penance gets us closer to our Sathguru! Obeisances to the Holy Lotus Feet! Jai Guru Datta Swamiji! Thank You for this beautiful message about peace. All things peaceful seem to be achievable once we hear the Bhajan in the flute form. Am a better human since the MMS have started. We, as normal humans are always under desire to achieve something. But, there is no guilt in this desire! And the desire that we get MMS all our lives also seems not a guilty one. Pranams to Appaji for giving this opputunity to better ourselves . Thnak you for the wonderful video, the background is breath taking…. with soothing music Gauri Taye. Due to day to day activities mind gets overwhelmed and needs some rest, Sri Swamiji bhajans and Music for Meditation and Healing CDs are a great way to get peace of mind. Sri Swamiji’s music is the only medicine used in our household to get peace of mind. Very beautifully said “There is no greater penance then peace”. Jaya Guru Dutta, thank you for the wonderful MMS Sri Swamiji and thank you for the great interpretation by Puttuji. The long struggle of life is to have peace. Every time we are in Mysore, or wherever we are with Sri Swamiji, we forget the mundane world, forget about every other existence in this world. Away from Swamiji’s physical presence, it is the thought of His Holiness that brings peace to me. Between the beginning and end of a day, we are battling with hundreds of things emotional, financial, physical and social. The sole aim of all these battles is to have peace prevailed. Many times we win, sometimes we lose. It is always the sense of Sri Swamiji in my heart that controls the waves of thoughts and feelings and brings nothing but peace. Since the whole life is a struggle to practice peace, to me it certainly is tapas. PEACE is something that we all long for. Swamiji is teaching us through this MMS that if we keep our mind clear of clutter and unwanted thoughts and distractions, we can attain PEACE. HE teaches us through MMS that we can be closer to HIM by following HIS teachings. Jaya Guru Datta. Well said Puttuji, PEACE has to come from inside, can’t get from outside. But mind always wanders around. It’s hard to control it or lock it on one thing. O’ my Sadguru, please give us enough energy to lock the mind at Sadguru’s feet and achieve the Peace. శాంతికి మించినది ఏది లేదు. చాల చక్కగా చెప్పారు. అప్పాజీ మనకు అందించిన భజనలు వింటున్న, పాడుతున్నా మనసుకు ఎంతో తృప్తి గ వుంటుంది. మా కోసం అప్పాజీ వున్నారు, అన్న నమ్మకమే అన్ని ఆందోళలని తీసివేస్తుంది. మనకు ప్రశాంతతని ఇస్తుంది. ప్రతిరోజూ మా కోసం ఎంతో శ్రమ చేసి ఇంత చక్కని MMS లు పంపుతున్న సద్గురు పాదాలకు శత కోటి వందనములు. Closing my eyes and journey inward in peace is what I like always. JGD! First I thought of Appaji always saying: patience is the greatest penance. And now peace? But in the end, I believe there is no contradiction. There can’t be any peace without patience. SGD! Where is Krishna energy then ? all our mental and physical discipline, what for? amidst the flowers, peace will definitely come ! Our senses love it. Our heart loves it. This is the best form of practice, as Puttuji precisely defines. WHAT a BLESSING ! reading this i remember one morning in flüeli ranft, switzerland, where sri swamijis guru gita seminar took place in july 2007. I had to bring my bicycle back to the hotel and get something when sri swamijis was walking along the front of the PAX MONTANA* towards the seminar hall in the village. I remember first feeling a wave of such a indescribable peace I never perceived before seeing sri swamiji gently walking. the peace He radiated was nearly tangible, to be felt physically and gave me the experience of what peace really is and how it feels. thinking about the unforgettable inscription in the universal prayer hall in mysore ashrama (which I always remember when patience is required and not easily gained) I conclude that peace is an enhancement of patience or the state of inner being (also) attained by the permanent practise of patience. Ich beherzige Puttujis Rat, höre und schaue diese Botschaft mehrmals an und verliere mich im Duft der Frühlingsblumen, in SWAMIJI und erlebe Frieden. Nothing can bring you peace but yourself. Puttuji explained so well, that we need to be peaceful inside then only we can reflect peace outside. Inner peace can be achieved by just implementing these daily beautiful MMS. I had a tense and confrontational situation today at work.. as soon as I saw this message, I realized I was tensed for no reason.. and I handled the meeting very well just by glancing at Appaji’s peaceful picture in the MMS.